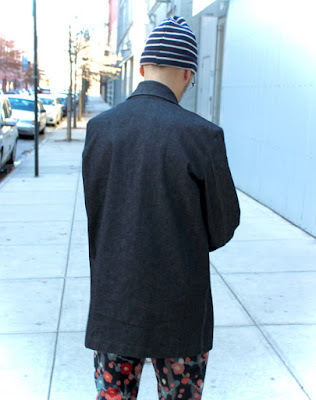 male pattern boldness: Peter Models the Black Denim Jacket! This was not a project long in the planning. 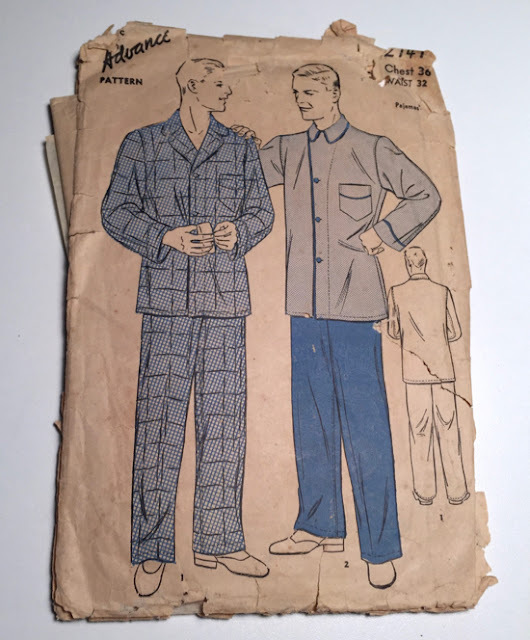 I just had this idea of using a vintage pajama pattern (above) to make a jacket. I didn't even muslin it, or I suppose you could say, this is the muslin. I'd never made anything with black denim before and I was pleasantly surprised -- and a little embarrassed after dissing the color black last month -- at how flattering I find this color on me (probably because it reads as more of a charcoal). 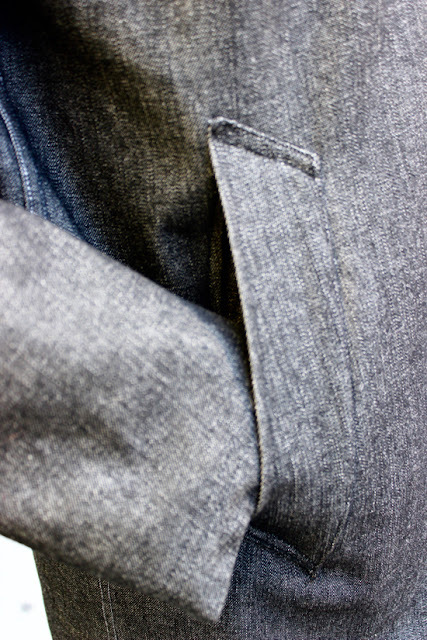 There's also something inherently elegant about stiff denim in a garment with simple lines. I'm very happy with this particular jacket and I know it's going to get a lot of wear this winter, as it's perfect for layering. I may have found my new favorite fabric. I was just leaving a comment on the mood page as this came up on my blog feed. Just wanted to say your selfish sewing recently has been very impressive. Peter, this is brilliant - and from a vintage pajama pattern! Did you get your 2 piece sleeve from another pattern, or dissect and draft the original sleeve? I used the sleeve from the peacoat pattern in the Japanese Men's Coat pattern book by Ryuichiro Shimazaki. Same with the side pockets. Denim is so versatile and one of my favorite fabrics to use in children's clothing and home crafts etc. Your jacket is fabulous. I love blue denim and black and every shade in between. You are very clever and this will definitely go with nearly everything and it looks great on you. Now Michael will definitely want one. So impressive, Peter. Those zips! Gosh - who would have thought to make a jacket out of pajamas. How clever. And no, your jacket definitely does not look like pajamas. The changes you made to it elevates it way out of the pajama field. Great job! Am I missing the front view? Looks great from behind! If you click the link at the beginning it will take you to the whole photo shoot. This may be the best thing you have ever made!!! Because you used your skills to make the best changes to the pattern. WoWWWW!! Have been using 12oz Natural Denim : http://www.bigduckcanvas.com/made-in-the-usa-fabrics/12oz-65-cotton-bull-denim-natural/ , for some time now and it gets softer as it is washed. Used a Fleece Jacket pattern with some minor changes to the pattern, and will be making another jacket soon with more changes to make it better. Nice thing about Denim is that it holds an ironed line, real well and that makes it easier to use. Love the jacket. So nice. All the details make it really special. Dear Peter, this is off topic but just wanted you to know that after sewing for over 50 years, your blog has taught me something. Maybe two somethings. Thank you. I enjoy reading your blog and watching what you sew.